A detoxifying and invigorating treatment to energise the body. A triple salt exfoliation with aromatic essential oils, a warming mineral-mud wrap and stimulating draining massage effectively eliminates toxins. Alleviate stress, smooth the skin and target areas of uneven contour. Exclusive use of our luxurious sauna and shower pre & post treatment. 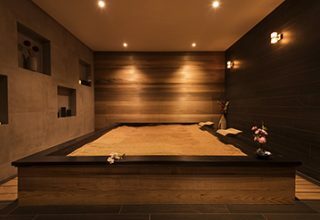 The dry heat of our sauna will flush out toxins and help to cleanse your skin, increase circulation and ease muscle pain. We use the exclusive Thalgo Descomask Exfoliator to help reveal new and healthy skin cells. It leaves your skin feeling silky smooth as it regains its radiance and softness. A great way to relax, empty your mind, increase blood circulation and improve concentration.